Ukulele players love their strings. When I played guitar, it seemed there wasn’t much difference between steel strings. 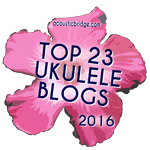 But a big range of tones is achieved with different strings on a single ukulele. The problem is, different strings sound and play different depending on the ukulele, so the only way to compare them is to try them. My Pono needed new strings – I change them about every 6 months – so I decided to try the strings that Jake Shimabukuro peddles for D’Addario, the Pro-Arte nylon classical guitar strings sold for ukulele. I’ve had Worth Clears on for a while. They’re OK but I definitely recall feeling like they were a step down in tone from the Martin strings I had on before that. They play nicely but I find them a bit thin on tone. I made a quick recording of the Worth Clears before changing strings, and then made a recording of the same thing with the D’Addarios on to see if I’d notice any difference. As I suspected, I definitely notice a difference in feel and tone. The D’Addarios are noticeably thicker and they sound warmer. I do like them better than the Worths. The D’Addarios add a lot of warmth, probably a little too much. I mostly fingerpick, and if I picked with fingernails, I think these strings would sound amazing. But I pick with the pads of my fingers. It makes these strings go from warm to a bit muddy. They do sound good, but I don’t think I’ll buy them again. If you’re a strummer or fingerpicker with nails and are looking for a lot of warmth without sacrificing volume, these D’Addarios are definitely worth a try.